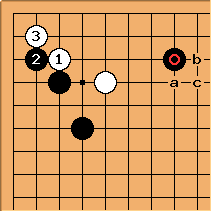 A possible sabaki technique for White in the presence of (or any of a, b, c), and probably extra stones. This is the ordinary continuation, with White living in the corner and creating an open skirt on the top side. 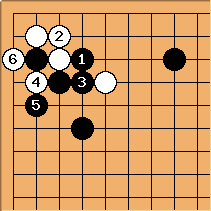 In fact, judging by pro games, this result is rarely good enough for White: this is nothing like joseki. It isn't used as often as one might suppose. That goes some way to explaining why more complex techniques, such as the cross-cut, are sought after in this type of position: this idea is for emergencies. It is of course conceivable that if Black is strong enough locally, connecting solidly with works to kill White. White mustn't wait too long here. On the other hand this staircase technique oughtn't be used too early, either.